Criminal law expert Ornat Cameron criticizes plea bargain signed with MK Ghattas. Attorney Ornat Cameron, an expert on criminal law, on Monday sharply criticized the plea bargain signed with MK Basel Ghattas (Joint List), according to which he will serve just two years in prison for smuggling cell phones to terrorists. 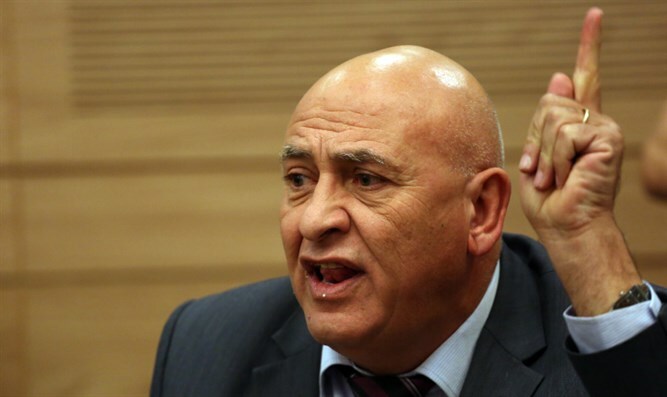 Ghattas on Sunday morning submitted his resignation letter to Knesset Speaker Yuli Edelstein as part of the plea bargain. Speaking with Arutz Sheva, Cameron said that, with the plea bargain, the State Prosecutor's Office sent a "forgiving message to the enemies of the state." "The priorities of the State Prosecutor's Office and its leaders are missing. Where has the fighting spirit of the State Attorney's Office gone? When we examine the case of former MK Ghattas in terms of evidence, it’s a done deal. All the evidence is there. We all saw former MK Ghattas smuggle cellular phones and SIM cards into a prison and transfer them to the enemies of the state, while taking advantage of his status [as a Knesset member],” she said. Cameron opined that citizens of the state of Israel should be concerned about the plea bargain. "I wonder, for example, why the United States has different priorities [on such matters]. I look at the example of Jonathan Pollard. How is it that Jonathan Pollard languished in prison for 30 years for crimes that are no less serious than those attributed to MK Ghattas, and even though the court recognized that it was espionage between two friendly countries, Pollard still sat in prison for many years?” she said. Cameron said she believes there is no room for a plea bargain in such a case. "In cases such as these, when you are dealing with security-related offenses, I think there comes a point where the State Prosecutor's Office has to draw some kind of line. When it comes to someone who acts to harm the state, we should not lend a hand to plea bargains, especially in a case where there were no evidentiary problems. It does not give a feeling of security to the citizens of Israel when the state signs a funny plea bargain with an enemy of Israel, and therefore we as citizens should be a little more concerned,” she concluded.